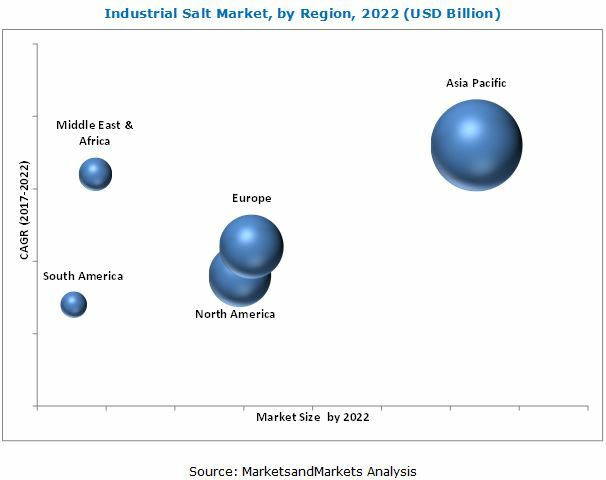 [168 Pages Report] The overall Industrial salts market is expected to grow from USD 12.70 billion in 2017 to USD 14.93 billion by 2023, at a CAGR of 2.8% from 2017 to 2022. Industrial salts are manufactured by the use of natural resources such as rock salt deposits or natural brine such as sea water and salty lakes. These are produced by conventional mining, vacuum evaporation or solar evaporation processes. Industrial salts are used in the chemical processing, de-icing, water treatment, oil & gas, agriculture among others owing to their availability in large quantities and cost-effectiveness. The base year considered for the study is 2016, and the forecast has been provided for the period between 2017 and 2022. The demand for industrial salts is driven by the growth of its application areas. Chemical processing is the major application of industrial salts. Industrial salts are particularly used as raw material in the manufacturing of caustic soda, chlorine, and soda ash. The increasing demand for these chemicals is expected to drive the consumption of industrial salts. High demand for these chemicals is expected in emerging economies such as China and India. Asia-Pacific is projected to be the fastest-growing market for chlor-alkali industry. The market for industrial salts in Europe is expected to grow slowly as the European chlor-alkali industry is undergoing a transition with the ban on mercury-based technology for caustic soda manufacturing. Several manufacturing facilities are being converted or shut down owing to the transition. However, the market is expected to pick up once the transition is complete. New manufacturing facilities in countries such as Egypt and India would increase the global production capacity of caustic soda, which would boost the market for industrial salts. Similarly, a growing number of water treatment projects are expected to increase the usage of industrial salts. Several water treatment projects are taken up which would enhance the demand for industrial salts. For instance, in India, as much as 27 water treatment projects are either under construction or in the pre-construction stage. These project would use industrial salts for the purpose of water softening and purification process. Use of industrial salts in de-icing is highly dependent on the geography and regional climatic patterns. Countries with high snowfall expectancy store industrial salts for clearing roadways. Instances of a shortage of salt supply for road de-icing have occurred in the past. Hence, countries have started accumulating more inventories for de-icing applications. During this research study, major players operating in the industrial salts market in various regions have been identified, and their offerings, regional presence, and distribution channels have been analyzed through in-depth discussions. Top-down and bottom-up approaches have been used to determine the overall market size. Sizes of the other individual markets have been estimated using the percentage splits obtained through secondary sources such as Hoovers, Bloomberg BusinessWeek, and Factiva, along with primary respondents. The entire procedure includes the study of the annual and financial reports of the top market players and extensive interviews with industry experts such as CEOs, VPs, directors, and marketing executives for key insights (both qualitative and quantitative) pertaining to the market. The figure below shows the breakdown of the primaries on the basis of the company type, designation, and region considered during the research study. 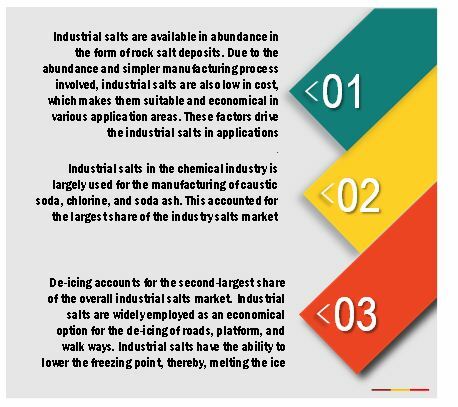 The industrial salts market comprises a network of players involved in the research and product development; raw material supply; component manufacturing; distribution and sale; and post-sales services. 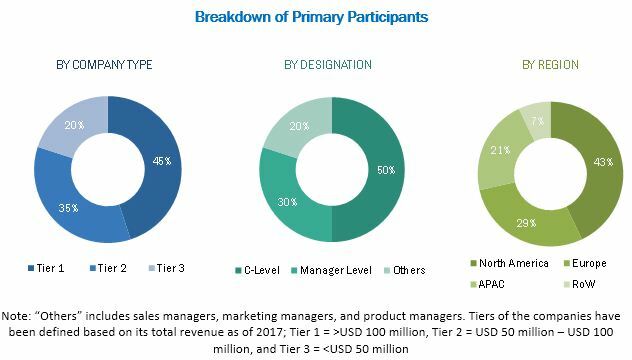 Key players considered in the analysis of the industrial salts market are K+S AG (Germany), Cargill, Inc. (U.S.), Compass Minerals America Inc. (U.S.), China National salt Industry Co. (China), Tata Chemicals Ltd. (India), Mitsui & Co. Ltd. (Japan), Rio Tinto Group (U.K.), COMPAGNIE DU SALINS DU MIDI AND SALINES DE L'EST (France), Dominion Salt Ltd. (New Zealand) and Exportadora de Sal de C.V. (Mexico). In August 2016, Cargill, Inc. has launched its new Diamond Crystal Fine Kosher Salt. The New product is manufactured specifically for the food processing industry in order to reduce product waste. How is the market scenario for the industrial salts market in the next five years? What are the strategies adopted by the key players to enhance/maintain their market share? The Industrial salts market was valued at USD 12.70 billion in 2016 and is projected to reach USD 14.93 billion by 2022, at a CAGR of 2.8% from 2017 to 2022 Growth of chlor-alkali industry is driving the growth of the Industrial salts market in the chemical processing application. The growing use of Industrial salts for de-icing and water treatment applications are also fueling the growth of the Industrial salts market across the globe. Agriculture and oil & gas among others are the application areas of industrial salts. Industrial salts are defined as sodium chloride manufactured industrially through extraction from rock salt or sea water. These salts are then further purified and blended with additives according to the requirement of the specific application. Industrial salts find usage in applications such as chemical processing, water treatment, de-icing, agriculture, and oil & gas, among others. The Asia-Pacific region accounted for the largest share of the industrial salts market in 2016. It was followed by the European region. Increased demand for Industrial salts from the Asia Pacific region can be attributed to the growth in the chemical processing and water treatment sector. Expansions of the chlor-alkali industry, as well as an increasing number of water treatment plants, are expected to drive the growth of the Asia Pacific Industrial salts market during the forecast period. Industrial salts are used as raw material for the production of different chemicals. Industrial salts in the chemical industry are largely used for the manufacturing of caustic soda, chlorine, and soda ash. The chlor-alkali industry manufactures caustic soda and chlorine by the electrolysis of industrial grade salt. Industrial salts are widely employed as an economical option for the de-icing of roads, platform, and walkways. Industrial salts have the ability to lower the freezing point, thereby, melting the ice. De-icing accounts for the second-largest share of the overall industrial salts market. Industrial salts used for de-icing is of the lowest grade with higher levels of impurities compared to grades used for other applications. Though industrial salts are inexpensive and are non-toxic, Concerns over environment and health in certain application have resulted in a slight decline in their usage. Usage of sodium chloride has resulted in changing the electrolytic balance in plants and trees. The salt is also corrosive in nature, resulting in damage to automotive parts. However, alternatives such as calcium chloride and potassium chloride are expensive and come with their own disadvantages. Innovations such as the use of magnesium chloride liquid along with sodium chloride for improved properties are expected to drive the market for industrial salts in de-icing applications. Industrial salts used for water treatment are typically employed in water softening systems. Water softening systems involve a process that effectively removes calcium and magnesium salts from water by ion exchange process using resins. Industrial salts are used for the resin regeneration, which would improve the performance of the resin as well as the system. Salts of different geometries such as coarse, granulated, or salt pellets are used for these purposes. Industrial salts are also used in the treatment of drinking water or swimming pools as a source of chlorine, which serves as disinfectants. Increasing demand for clean water is expected to drive the market for industrial salts in the water treatment application segment. Industrial salts are used as an additive in mud used as drilling fluids. This mud lubricates and also acts as a coolant for the drilling head. Industrial salt obtained from solar evaporation, vacuum pan evaporation, or conventional mining processes are used for this application. The performance of the drilling fluids varies largely on the concentration of salt in the mud. Salt in drilling muds also serves as flocculants, thinners/dispersants, diverting agents, acidizing specialty additives, and stabilizers. With newer oil & gas drilling wells projected to start, the demand for industrial salts is expected to increase. What are the global trends in the industrial salts market? Key players in the market include K+S AG (Germany), Cargill, Inc. (U.S.), Compass Minerals America Inc. (U.S.), China National salt Industry Co. (China), Tata Chemicals Ltd. (India), Mitsui & Co. Ltd. (Japan), Rio Tinto Group (U.K.), COMPAGNIE DU SALINS DU MIDI AND SALINES DE L'EST (France), Dominion Salt Ltd. (New Zealand) and Exportadora de Sal de C.V. (Mexico). These players are increasingly undertaking mergers and acquisitions, and product launches to develop and introduce new technologies and products in the market. 10.4 Mitsui & Co. Ltd.
10.6 Compass Minerals International Inc.
10.8 Exportadora De Sal De C.V.
10.9 Ineos Group Holdings S.A.
10.10 CK Life Sciences International Holdings Inc.
10.11.12 Dev Salt Pvt. Ltd.
10.11.15 Naikai Salt Industries Co. Ltd.